- bad electrical connections: mouse freezes. But if one shakes the cable, the problem disappears. - I change the cable but still the same phenomena. -> sot the connector may be the culprit. 1) shutdown the machine (ADB is not USB and does like hot interruption of connection). 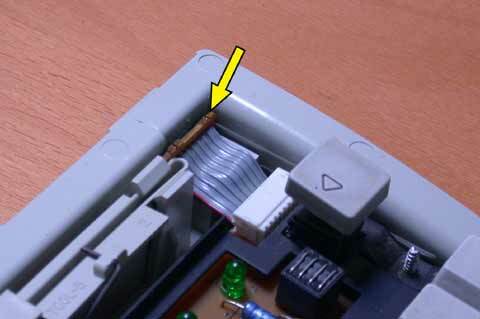 2) disconnect the cable and the mouse. 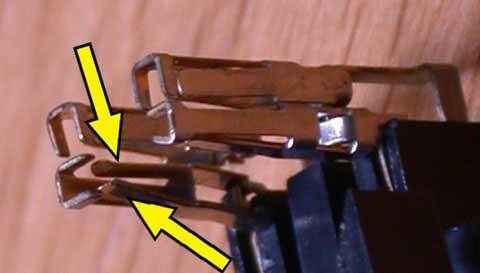 The blue arrow shows the screw to be removed...the yellow one, the dead connector. 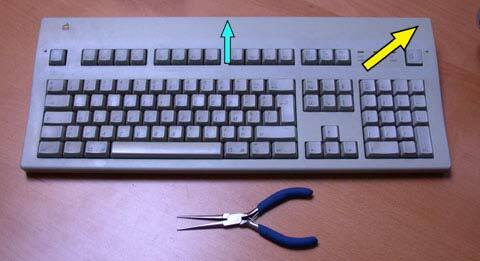 Then, the keyboard is simply clamped. The tool in the foreground will be used later. 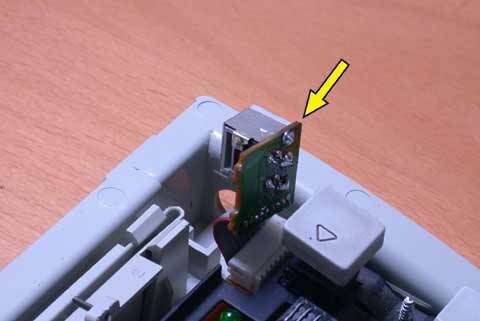 On the connector side (yellow arrow), the electronic board has to be vertically lift up. Do the same thing on the opposite side. 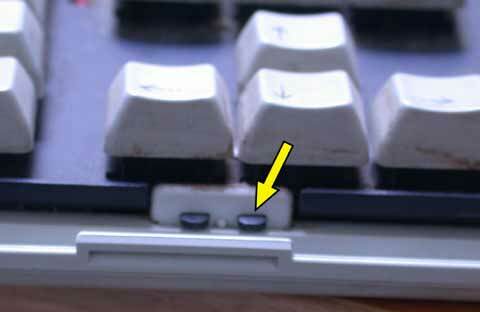 The keyboard has to be removed from its shell by unclamping it at the spots shown by the yellow arrows. 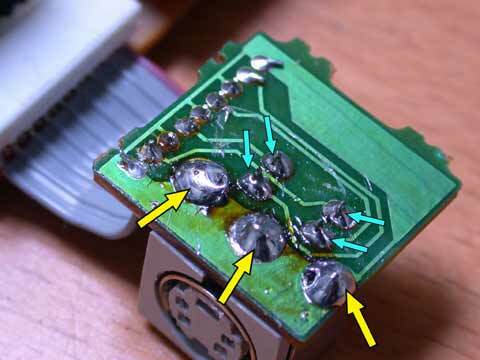 Take care, when the metallic part has been removed, that the locking clamps do not close again and damage the electronic board. 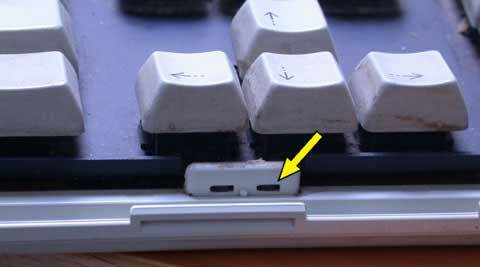 In its inferior part, the keyboard is fixed by lugs (yellow arrow). So, we have to slide it to the rear to extract it. 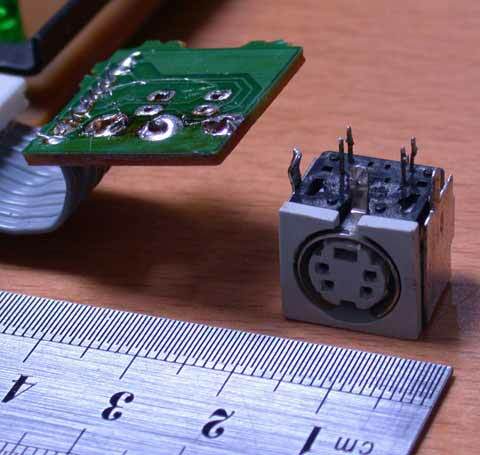 Now the connector itself. We can unweld it: yellow arrows point the weld spots of the shell in which the connector is fixed, the blue ones the connector's weld spots. The ruler also helps as a lever to extract some welded pieces without damaging them. 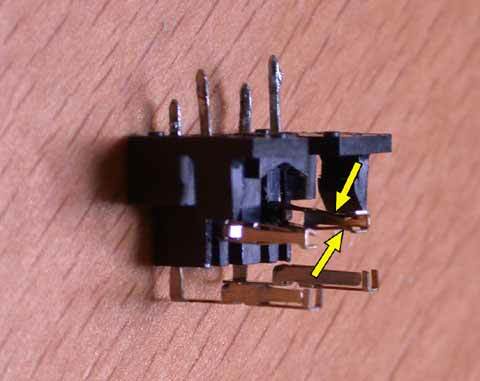 The connector's shell removed: we have to extract the black piece (yellow arrow) from both its sides: be carefull not to damage the connector's pins. 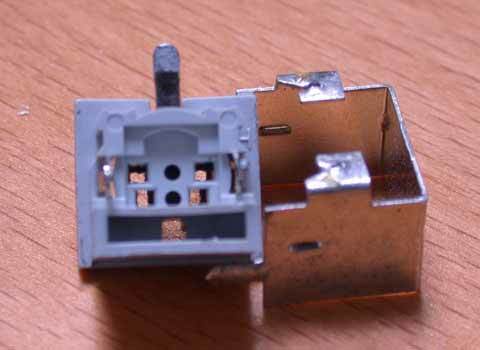 The shell and the plastic piece which acts as a guide for the connector's pins. A good time is coming when we will have to reassembly the whole stuff! Now, we are using the tool seen sooner... to tighten up the contact blades pointed by the yellow arrows. Same operation, but a more detailled picture. 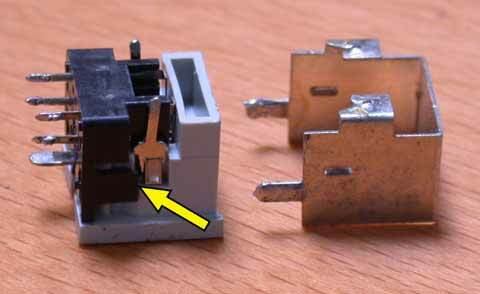 (the inner diameter of the plug is around one square mm). As usual, follow these instructions in a reverse order to rebuild the connector.